No more chunky hard ice snow cones! Our Block Ice Shaver produces the highest quality snow possible, snow so fine that it rivals real snow! It literally absorbs the flavor so you experience a smooth ice texture and true-to-life flavor consistency from the first bite to the last. We are dedicated to providing the best quality shaved ice possible, as well as fun service and a great environment. Decisions…decisions…decisions! 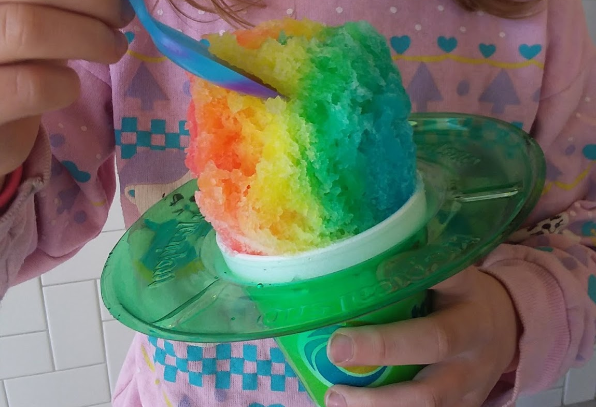 Tropical Sno provides you with nearly limitless choices offering over 40 flavors, and hundreds of concoctions! Don’t forget about our famous Sour Spray, Vanilla, Banana, or Coconut cream toppings, or try it “Hawaiian Style” with a scoop of ice cream at the bottom! Lite Flavors Available. Your perfect treat is waiting for you to discover. We would love to have you join our team, or as we call it, family. Start your application online today or drop in to one of our locations to apply! We are always looking for great applicants that appreciate Tropical Sno as much as we do.